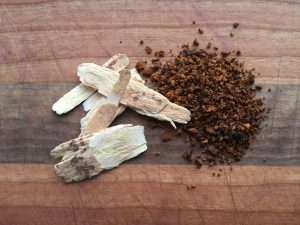 Chaga is a medicinal mushroom that grows on birch trees, so it can be locally sourced in Ontario. Chaga is high in antioxidants and has antimicrobial properties. It is also rich in beta-glucans which help modulate the body’s immune response. It’s an inexpensive and powerful ally in keeping you healthy. It’s also very simple to make! Put dried herbs into a pot and add water. Bring to a boil. Reduce heat and simmer for at least an hour. Strain the herbs and store them in the fridge. Enjoy 1-2 cups per day. I prefer this mix diluted with hot water to make a warm beverage. Experiment and see how you like it best!